I think we all agree that a big girl needs the right dress when there’s a party on the agenda. And in Birdie’s Big-Girl Dress, by Sujean Rim, that’s just what Birdie needs: the perfect big-girl dress to show off her party personality. In case you didn’t know, Birdie is a pint-sized fashionista with an eye for shopping and a birthday just around the corner. Her three very best friends have already found their party outfits, but nothing Birdie tries on at the fancy dress shop works for her. One dress is too long for dancing, one’s too snug for eating, and one’s too fancy for playing in. What’s a fashionista to do? Then Birdie returns home and remembers the upstairs attic, which is full of old clothes, scarves, hats and wigs. Could some used items from the attic make Birdie just as happy as a brand new outfit would? Well, I’m not telling you; you’ll just have to read the book to find out. Birdie’s Big-Girl Dress is a super-sweet, super-brief little book about growing up and coming of age – even if it is still a very young age. Author Sujean Rim does a great job of capturing the feel and sound of early elementary school girls with big-girl dresses on their minds. Rim’s illustrations are done in whimsical watercolors that welcome picture book lovers with every bright, basic color in the crayon rainbow. Also, the book’s pace is interesting in that, though the text is brief and to the point, it still manages to move along at just the right speed without making the reader feel rushed or slighted. 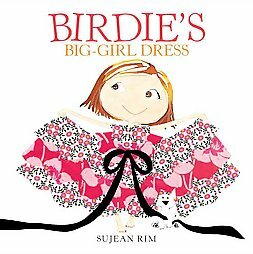 Be sure to pick up a copy of Birdie’s Big-Girl Dress for your burgeoning fashionista. In fact, while you’re at it, pick up it’s fraternal twin, Birdie’s Big-Girl Shoes (also by Sujean Rim) and add them both to your child’s personal collection.